This entry was posted on Thursday, June 25th, 2009 at 5:01 am and is filed under Photography. You can follow any responses to this entry through the RSS 2.0 feed. You can leave a response, or trackback from your own site. These portable altars, in the collection of Yemrehana Kristos Church, are an interesting relic of the unique liturgical heritage of the Ethiopian church. The style of the altar derives directly from carved stone incense burners used as part of Sabean (South Arabian) religious customs, dominant in Axum at some point before the adoption of Christianity in 330. 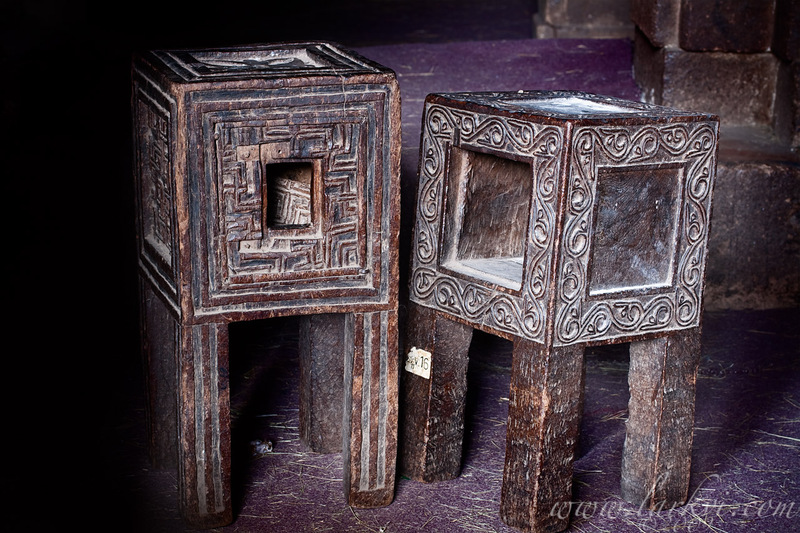 Over time, the incense burners evolved into closed wooden altars, and were later replicated in stone, with permanent, stationary, carved monolithic altars at some churches (most impressively in the Selassie Chapel in Lalibela) carved to resemble portable altars. The use of portable altars, their replication in stone, and changes in the pattern and number of altars may be used to re-construct elements of the liturgical history of Ethiopia (for more on this, see the work of my advisor, Michael Gervers).